The Canada Express Entry System is one of the best ways of skilled immigrants to migrate to Canada. This Express Entry point calculator follows a particular format. This is a point based system. The applicant has to try and score as many points as possible from different factors. More the number of points better are the prospects of the person to get an invitation to apply for the Canadian PR visa. 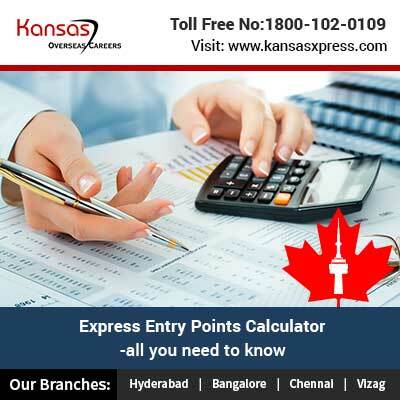 It is important that you know the factors on which the Express Entry points calculator is based. The candidate has a chance to score 28 points in this category. 24 points are for English language proficiency. 4 points are for French language proficiency. So, the candidate who has English as the first language has the chance of getting up to 24 points in this category. get 10 points and so on. Depending on the work experience one can get up to 15 points. Better the work experience better will be the points that you can score. One year work experience will get you nine points, two years of work experience will give you 10 points. This way a work experience of 6 years or more can help you score up to 15 points. Here too better the academic qualification better will be the number of points that the applicant can score. You can score maximum of 25 points. Ph.D. will get you 25 points, post graduation will get you 23 points, 3 years graduation will get 21 points, a diploma will get 19 points and higher secondary education will get you 5 points. Here the candidate can get up to 10 points. The job offer has to be from a Canadian company. It has to be recognized by the labor market of Canada government. The job has to be pertaining to the occupation that is selected in the skilled occupation list. Here one can get up to 10 points. But there are a number of factors on which these points are based. For example, a first blood relative in Canada can help one get 5 points. Education and work experience of Canada etc can help get around 10 points. Overall for Canada immigration through the Express entry point calculator system one needs to score as many points as possible. Some factors like age there is no control. But one can try and improve the points tally by concentrating on other factors like education, language proficiency etc.